I used to live next door to this house, in a rental house that we had named, “The Cherry Plum house”. But one day, this house went into foreclosure. It was purchased by a guy who usually buys homes in foreclosure and then turns them into rental homes. But for the first time, he decided to flip one of his house purchases. So he put $30,000 worth of repairs into this house, and then sold it to me. My wife and I then knocked down the fence between the two houses, and moved our household goods over to our new home, in May 2013. We used to have a master plan for the Cherry Plum house. But when we moved to this house that sort of went by the wayside. We got a lot of that plan finished, and then had to “undo” some of it for our move to Harvest House. Grey areas are concrete, brown areas are dirt, darker brown is mulched areas, green is grass. There is less growing area at Harvest House than there was at the Cherry Plum house. But this is OUR home, so we can make major changes. We are still following some of the older plan. We have a planned greenhouse, and we plan to turn an existing shed into a “fish shed” for aquaponics. But there is a lot of things that we need to do first in order to get to the next stage. Our first goals are to fix up the property, remove unwanted structures, and build a woodshop where I can make the things we will need for our plans. Tore down the two extra sheds in the backyard, and removed a concrete pad for one of those sheds. Tore down the old fence material. 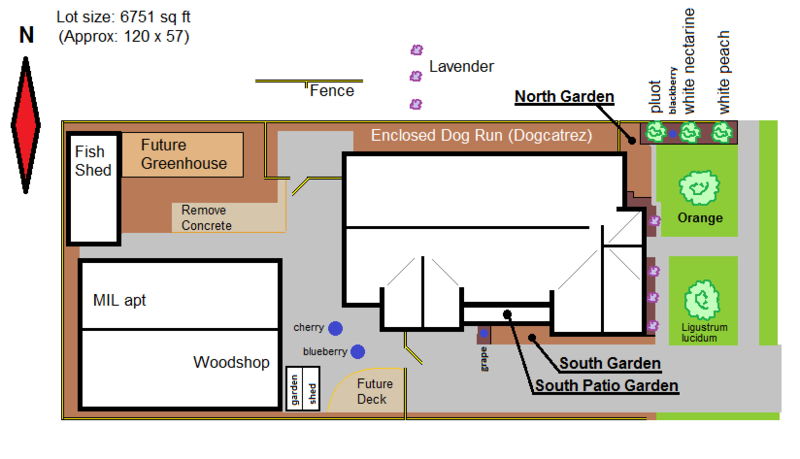 Created “Dogcatrez” – the ultimate in dog runs, featuring an “escape proof” trench completely around the dog run, filled with sheets of tin, and concrete rubble and random large rocks. Any dog that wants to dig out, must dig more than three feet down before digging out. Flight leutenant Danny Velinski himself would have problems digging out. Planted 3 fruit trees in the NE corner of the lot. Got the woodshop online and built a long grape trellis for the South side of the house. Rebuilt the doors to the root cellar to make them more secure, and prevent them from warping. Trimmed the front yard trees, and started feeding the orange tree heavily so that it would produce this year. Created a “temporary deck” covered seating area. Started the project design for an aquaponics control system. It will probably be Arduino based, but right now is in the block diagram stage. Started purchasing parts for the woodshop. The hardest to find purchase was a framed set of double doors that could be secured. Built a woodshop feed and assembly table – a large table on wheels used as an outfeed table for the tablesaw. It also has storage built into it, and it can be used to assemble large projects. Butchered the goats (they are in our freezer now, and we’ve already started turning them into meals! Removed the garage door and walled in the woodshop. Continued improving the woodshop, including adding cabinets and wood storage, and painting the interior. Built a raised grow bed for the backyard. Updated the automatic watering system, and repaired or moved irrigation pipe. Mulched in the Lavender bushes, the grape vine, and the North East Orchard.